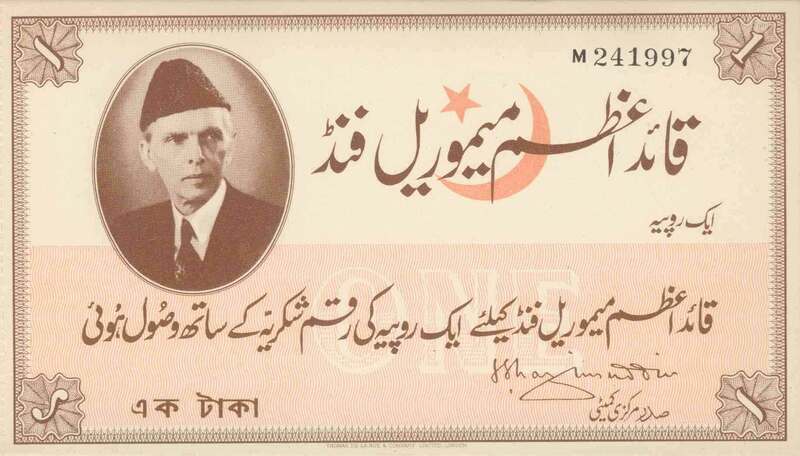 For the last few years, items have been appearing on banknote dealer’s lists that have been variously described as ‘cash coupons’, ‘emergency issues’, or similar, issued in Pakistan. These items have been represented as such, usually out of ignorance, as Urdu is not the most widely spoken language outside the sub-continent. The items are in fact receipts for donations to the Mohammed Ali Jinnah Memorial Fund, given to recipients who donated to the fund. There were four different receipts prepared, in the denominations of 1, 5, 10, and 100 rupees. A common 1-rupee receipt, coloured light and dark brown. A blue and green 5-rupee receipt. This denomination is not common. This 10-rupee receipt, printed in red and orange, is very difficult to find. Printed in green and yellow, the 100-rupee receipts are also very difficult to acquire. The receipts carry a signature, below which is the title ‘Chairman of the Central Committee’. At the far left toward the bottom of the receipt is the Bengali text for ‘one taka’. The phrase ‘Quaid-i-Azam’ translates as ‘The Great Leader’ and is the term commonly used in Pakistan to refer to Mohammed Ali Jinnah. The mistaken conclusion that these receipts are some type of currency is probably due to several factors. Firstly, and primarily, the receipts carry the printer’s imprint of ‘Thomas De La Rue and Company Limited London’. 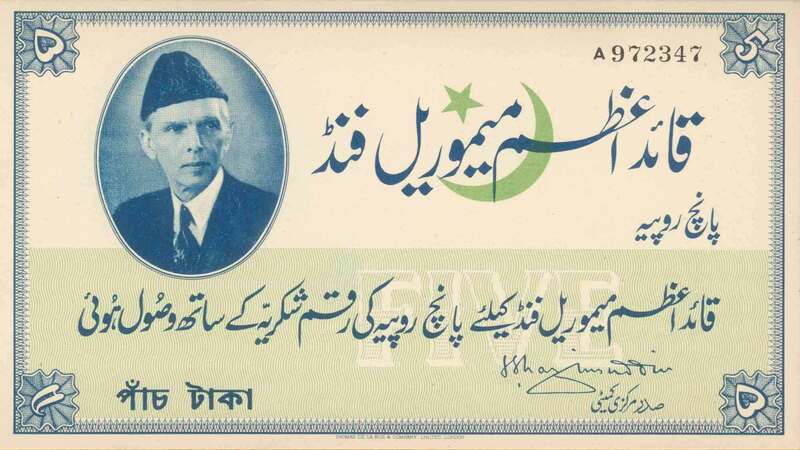 Secondly, the portrait of Mohammad Ali Jinnah is the same portrait that is used on many banknotes issued in Pakistan. Thirdly, each receipt carried a serial number. Finally, for those who can read a little Urdu and Bengali, the use of ‘One Rupee’ and ‘One Taka’ hint at a monetary value. The last observation was compounded by the repetition of the value of the receipt in the four corners of the receipt in various forms of numerals. All together, the receipts carry the appearance of a note with some value, printed by one of the world’s leading security printers. It is, therefore, not surprising to find that the receipts have been mistaken for some type of currency. Issued during the 1960s, all receipts are printed on plain off-white thick paper, with the 1-rupee receipt printed in light and dark brown, the 5-rupee receipt printed in blue and green, the 10-rupee receipt is red and orange, while the 100-rupee receipt is green and yellow. There is nothing printed on the back of the receipts. The Mausoleum, or Mazaar, of Mohammed Ali Jinnah was a troubled project that took many years to complete. Although Jinnah died in 1948, it was only in 1956 that a committee was formed to organize the building of the mausoleum. After consulting the leading engineers of the country, an international design competition was undertaken, with the winning design of the British architect Raglan Squire being announced in 1958. However, Fatima Jinnah, the sister of Mohammed Ali Jinnah, rejected the design and insisted that a design by Yahya Merchant of Bombay be accepted. In 1960 General Ayub Khan, the President of Pakistan, approved the design proposed by Fatima Jinnah and work commenced. Although the white marble Mausoleum was completed in 1970, the gardens that were intended to be built around the mausoleum were not completed at that time. The gardens languished until 1999 when President Musharraf gave the direction to complete them. During the ten years that it took to build the mausoleum, various problems were encountered, one of which was a lack of money. In an effort to raise funds, donations were sought from the public and the receipts illustrated here were prepared to give to donors. While these receipts are not ‘cash coupons’ or ‘emergency issues’, they are nevertheless interesting items for collectors of Pakistani banknotes. 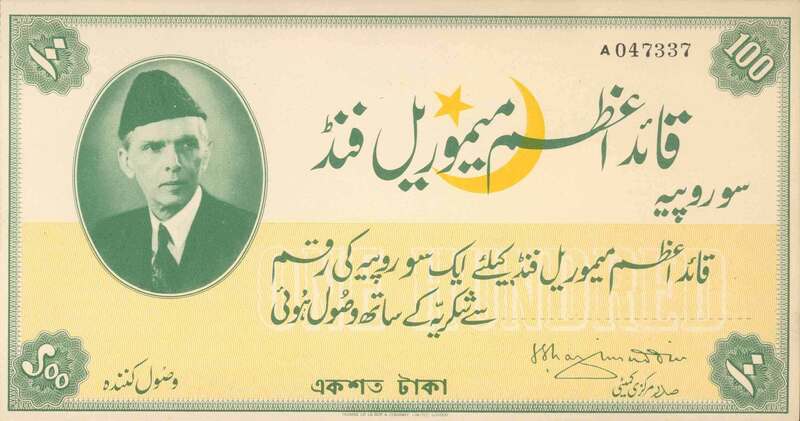 It is because they carry the famous portrait of Mohammed Ali Jinnah, which appears on the banknotes of Pakistan, and because they are printed by Thomas De La Rue and Company, who printed Pakistan’s first banknotes, that the receipts are of interest. While the 1-rupee receipts are reasonably common, receipts for the higher values are quite rare, particularly the 10- and 100-rupee receipts.